My Mom liked to bake, especially bars and squares. 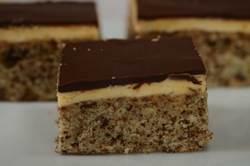 This three layer bar, which my Mom called a Tweedie Square, was a favorite in our family. Not sure how this name came about, but maybe it's because of the "tweed" look of the bottom layer. The tweed color comes from folding grated dark chocolate into a white cake batter. Once this layer is baked and cooled it's followed by a layer of rich vanilla buttercream. The Squares are then finished with a delicious coating of dark chocolate. Tweedie Squares start with a layer of white butter cake. To achieve that pretty "tweed" look, grated semi sweet chocolate is folded into the batter. The trick to getting a nice 'tweed' look is not to over mix the batter as you want to see flecks of chocolate in the white batter. The second layer of these Squares is a rich buttercream made with dried custard powder, which was the invention of an Englishman, named Alfred Bird. He invented this powder because his wife loved homemade custard but was allergic to eggs. Alan Davidson in his "The Oxford Companion to Food" tells us that this powder is not, in fact, a dried form of real custard but is just cornflour (cornstarch) and sugar that has been colored and flavored. When the dried custard powder is used in this buttercream it adds a nice flavor and color. Custard Powder (Bird's Custard Powder is the most popular brand) can be found in some grocery stores, in specialty food stores or online. But if you are unable to find it, just substitute it with an equal amount of instant vanilla pudding or you could leave it out completely and just add a little more powdered sugar. The finishing touch to these squares is a coating of semisweet or bittersweet chocolate. I use a good quality chocolate, one that you would enjoy eating out-of-hand. I do like to add a little shortening or butter to the melting chocolate as I find it makes it a little easier to spread. Tweedie Squares: Preheat your oven to 350 degrees F (180 degrees C). Butter or spray a 9 inch square (23 cm) baking pan with a non stick vegetable spray. Bottom Layer: In a separate bowl whisk the flour with the baking powder and salt. In the bowl of your electric mixer, or with a hand mixer, beat the butter and sugar until light and fluffy. Add the eggs, one at a time, beating well after each addition. Beat in the vanilla extract. Scrape down the sides and bottom of your bowl as needed. With the mixer on low speed, alternately add the flour mixture (in three additions) and milk (in two additions), beginning and ending with the flour. Then gently fold in your grated chocolate (do not over mix). Pour the batter into your prepared pan, smoothing the top with an offset spatula or the back of a spoon. Bake for about 18 - 20 minutes, or until a toothpick inserted into the center of your cake just comes out clean (the cake will just be starting to pull away from the sides of your pan). Remove from oven and place on a wire rack to cool completely. Middle Layer: In your electric mixer, or with a hand mixer, beat the butter until smooth and creamy. Add the custard powder, vanilla extract, and powdered sugar and beat until the mixture is smooth and spreadable. Add a little milk or cream if the mixture is to thick and doesn't spread easily. Spread the filling over the bottom layer, cover, and refrigerate until firm (about 30 minutes). Top Layer: Chop the chocolate into small pieces. Then, in a heatproof bowl, placed over a saucepan of simmering water, melt the chocolate and shortening (or butter). Spread the melted chocolate evenly over the filling and refrigerate for about 10 minutes or just until the chocolate has set. Using a sharp knife, cut into squares. Yield: Makes about 25 squares. Use of materials on all pages on the domains Joyofbaking.com, joyofbaking.mobi, the Joyofbaking.com Facebook Page, @joyofbaking on Twitter, the Joyofbaking.com RSS Feed, the Joyofbaking.com email list the Joyofbaking1 YouTube Channel and any emails sent from @joyofbaking.com are entirely at the risk of the user and their owner, iFood Media LLC will not be responsible for any damages directly or indirectly resulting from the use. References cited may include a link to purchase the referenced book or item on Amazon.com. Joyofbaking.com receives a commission on any purchases resulting from these links. This website and the contents are not endorsed or sponsored by the owner of the "Joy of Cooking" series of books or its publisher Simon & Schuster, Inc. and is not related to the "Joy the Baker" books and website. Video icons by Asher. Content in any form may not be copied or used without written permission of Stephanie Jaworski, Joyofbaking.com. Students and non profit educators may use content without permission with proper credit.